Dover's assistant coach stood up in the first quarter to get a better view of a play. Concord High’s football team just had its Homecoming game Oct. 14 against the Bedford Bulldogs. The Crimson Tide ended up losing the game 56-13. The team’s current record is two wins of the season, against Spaulding and Manchester Memorial, and five losses. The team has two more games before the end of their season: an away game in Portsmouth Oct. 20 and the last game of their season, home against Exeter, Oct 27. The Concord Crimson Tide football team on Sept. 15 played against Dover Green Wave’s football team for their first home game of the season. 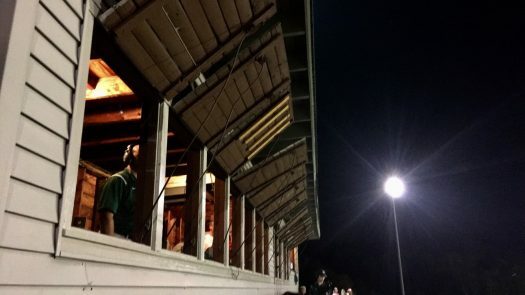 The Connolly Press Box had opened and was filled with journalists from local newspapers, Concord and Dover coaches and CHS Social Studies teacher Chrigus Boezeman who announced the entire game. 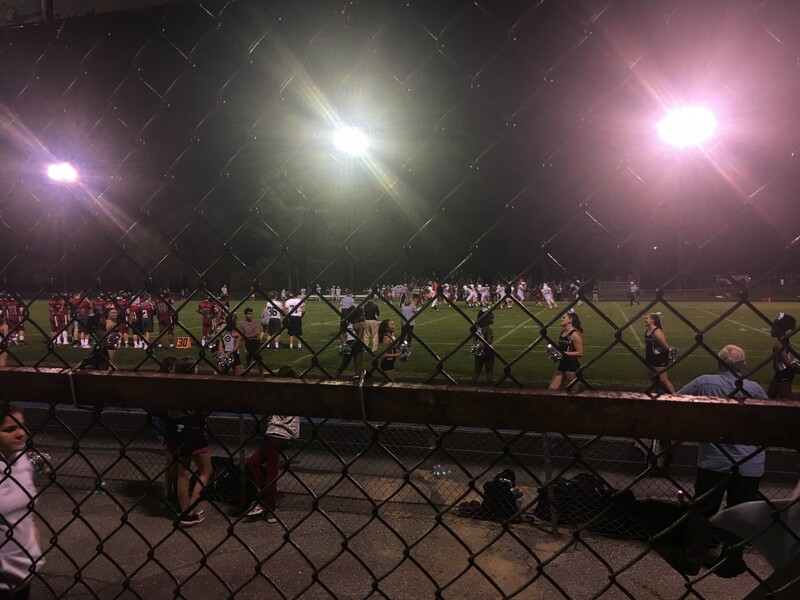 The Crimson Tide had the advantage of playing on their own turf this game, they had the support of their fellow students and Concord community, but Dover ended up scoring the first touchdown of the game. In the last three minutes of the first quarter Concord High junior Isaac Gladey had a 38-yard rush and ended up scoring the first touchdown of the game for the Tide. 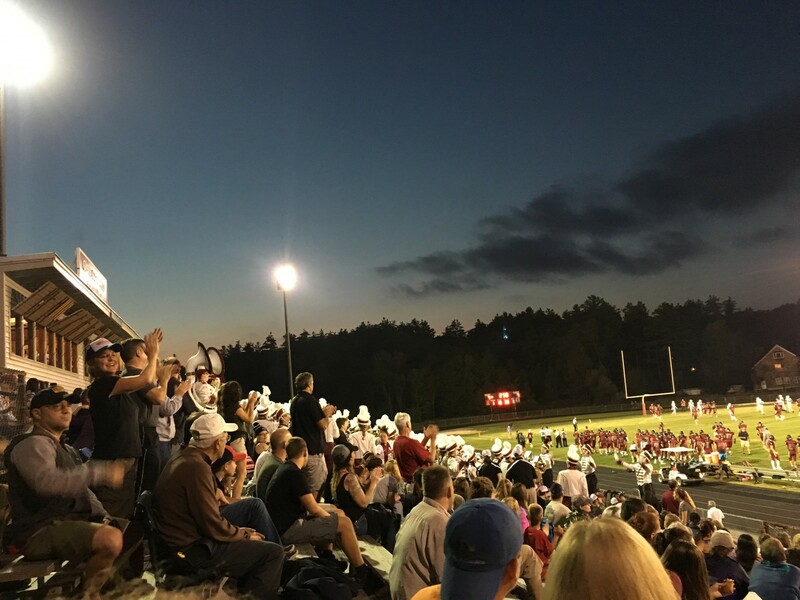 The Concord bleachers erupted in cheers and the touchdown quickly got everyone on their feet with the excitement of a tied game. The band stood up as well and began to play “Three Cheers” in celebration of the scored touchdown. Everyone was hoping for the first win of the season and things were looking up for the Tide at this point in the game. Inside the Connolly Press Box, Boezeman, wearing his usual bandanna, stood beside Concord High math teacher Derek Mercier. The opportunity to become the announcer came at a cost. Former Principal Gene Connolly had been announcing the games for a very long time before retiring at the end of the 2015-2016 school year. “Principal Connolly had been setting the high bar in that seat for over a decade,” said Boezeman. Athletic Director Steve Mello then asked Boezeman if he wanted to “take the mic.” Accepting the job had been bittersweet, Boezeman explained, because had it not been for Connolly’s ALS diagnosis, Connolly would have continued calling games. “It does feel good to say the phrase, ‘Gene Connolly Press Box’ throughout the city on a clear Friday night,” he added. 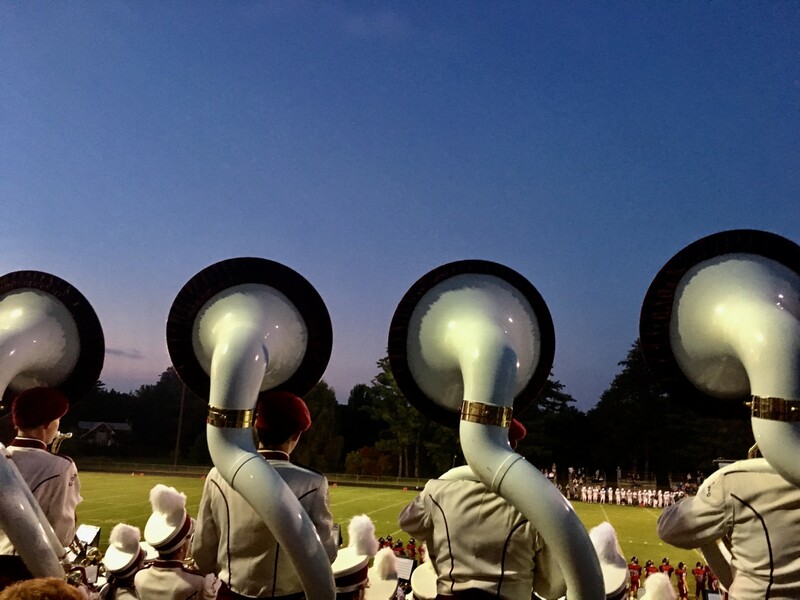 The Tide’s sousaphones stood tall in the band section of the bleachers. The band’s goal during the first half of the game is to get the crowd riled up and supporting their team. The sousaphones are the only instruments in the band that has the rolling crimson wave insignia on them. Sitting directly behind the band for the entire game was Paige Wirbal, a junior at Concord High. “I only come for the band,” she said. She is not alone. Plenty of people attend to support friends in the band or just listen to the songs. In fact, some people head to band shows on football fields on a regular basis. 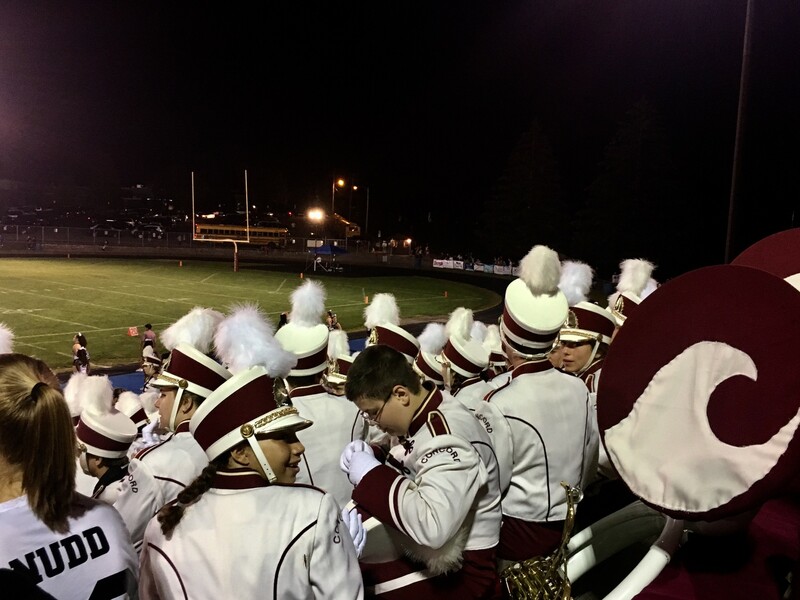 Concord High School’s marching band performed in the annual Salem Band Show on Oct. 7 alongside other high school bands from all over New Hampshire. 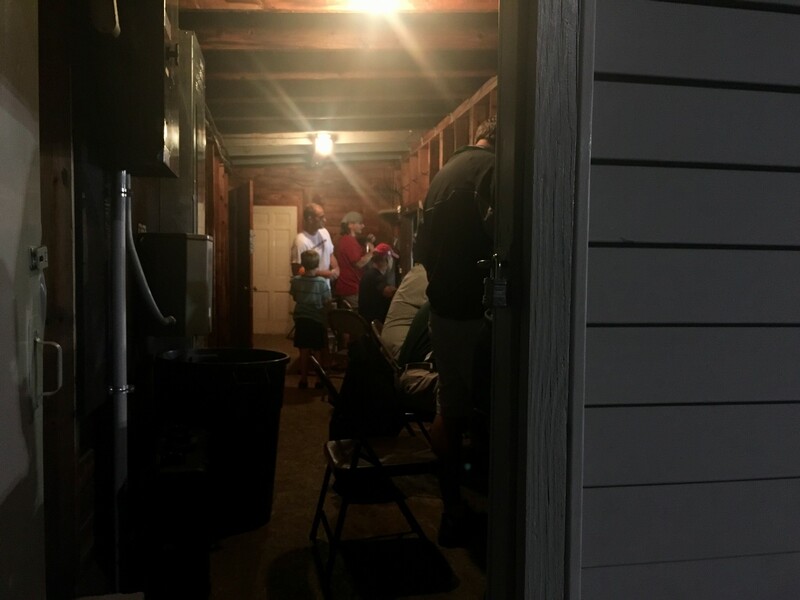 The band even consists of some of the football players who play their instrument while wearing their uniforms during the halftime show, and many various athletes are in the band as well. Concord High’s cheerleaders pumped up the crowd and cheered on the football team during the first half. The football players not on the field as well as the cheerleaders stood and watched various plays unfold. At one point Concord scored a second touchdown and led by 13-7. The crowd went wild that Concord had taken back the lead and the cheerleaders were celebrating as well. Football games also draw people who hope to play on the team or in the band when they too reach high school. 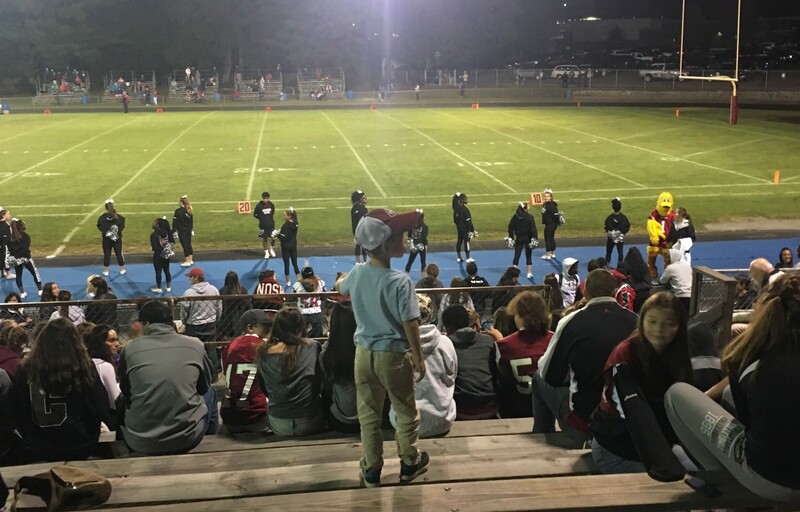 As the Tide was farther up the field during the second quarter of the game, a young local Concord supporter, shown at left, stood in the bleachers repping his Crimson Tide hat. He focused mostly on the section where all the students sat and stood, cheering and blowing horns in school pride. When the Tide scored another touchdown he jumped up and down in joy.